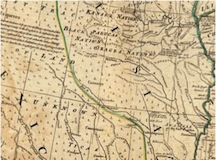 Detail of the present-day Oklahoma region from Thomas Jefferys’ American Atlas: or, a Geographical Description of the Whole Continent of America (1776), courtesy of the Department of Special Collections and University Archives, McFarlin Library, the University of Tulsa. George Cooke. 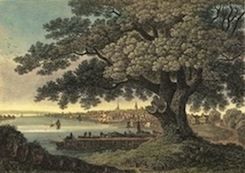 Philadelphia from the Great Tree Kensington, under which Penn, made his Treaty with the Indians. American Philosophical Society. Permission to publish required.